Never dive alone - The minimum snorkelling party is 3; a buddy pair to lookout for each other in the water and a shore lookout. Train with a recognized training scheme, explore institutions that help people build skills and technique and enjoy the sea; safely. Check your equipment - A strap breaking on a fin, a badly fitting mask or a leaking snorkel valve while you're at sea can all cause problems and discomfort. 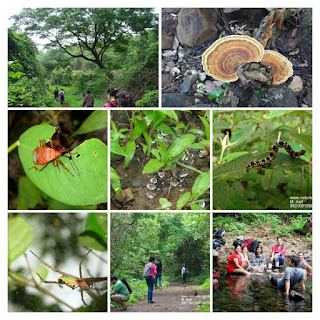 Taking good care of the equipment and checking it carefully can reduce the chances of problems. Choose a safe site - Avoid areas with heavy boat traffic, dangerous currents and rip tides. Make sure the entrances and exits to the water are easily accessible and that there are alternative places to exit if the dive is cut short. Check tides - The safest times to snorkel are at the slack water, which usually occurs near high or low water. Check weather and sea state - Before setting off check the weather forecast . Although rain can be unpleasant it isn't necessarily as bad to dive in the rain as in a wind . Wind can cause waves to increase which make snorkelling tough. Force 3-4(12mph+) is usually enough to cancel. Don't hyperventilate - hyperventilation can reduce the levels of CO2 in your lungs , which decreases the trigger to breathe and can lead to black outs. There is a very strong connection between freediving and snorkelling, and have always been concerned that proper safety is maintained while snorkelling." Snorkelling and breath holding diving are some of the most exciting ways to see the fantastic range of life in the seas. A few safety tips to help you enjoy the sport safely. 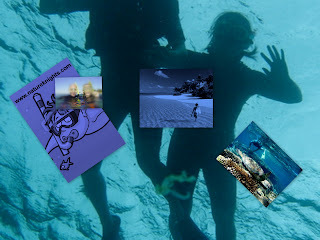 How to choose a Snorkeling locations? Snorkeling is possible in almost any body of water, but snorkelers are most likely to be found in locations where there are minimal waves, warm water, and something particularly interesting to see near the surface. Generally shallow reefs ranging from sea level to 1 to 4 meters (3 to 12 feet) are favored by snorkelers. Deeper reefs are also good, but repeated breath holding to dive to those depths limit the number of practitioners and raises the bar on fitness and skill level. The most important thing for a first time snorkeler is to get comfortable wearing the mask and breathing through the snorkel. Some people get anxious and have difficulty breathing through a snorkel while wearing a mask, so it is important to test things out in shallow water first. Many first timers have jumped into the water on a snorkeling charter only to realize they aren't comfortable wearing a mask and breathing through a tube - this often takes a few minutes to get used to. While standing in shallow water, practice putting your face below the surface and looking through the mask. You can breathe through the snorkel while looking around at the aquatic life. In shallow waters this can be a fantastic way to see many things without expending the energy of swimming. Snorkeling in shallow water is also a good time to learn to use the equipment effectively. Although relatively simple, beginning snorkelers should know their way around their mask and snorkel, including how to clear both of water. This is an essential skill, as open waves or splashes can send water into the open end of a snorkel, and masks can develop tiny leaks during a dive. Having a mask or snorkel fill with water can be a scary experience the first time, so snorkelers should be comfortable with the process of clearing their equipment. Clearing a snorkel is an easy process. If you find your snorkel tubes clogged with water simply exhale with a strong force through your mouth, which should send the water up and out the end of the snorkel. 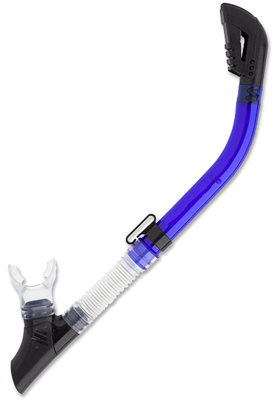 Some snorkels come with built-in drainage valves, allowing the water to be pushed out a one-way valve. This makes it easier to push the water out if a small amount of water makes it way into the tube. Clearing a mask is similar to clearing a snorkel, but can seem more difficult because of the reduced visibility. To clear out a mask, simply lift your head out of the water and pull forward on the front of the mask. This will open up a gap in the bottom of the mask, allowing the water to drain out. Some masks come with built-in purge valve, which serves the same role as the drain valve on a snorkel. By including a one-way valve which lets water out but does not let water in, snorkelers can clear a mask of water by simply blowing air out their nose while the mask is on. The water will be pushed out the valve, clearing the mask. Even masks without a built-in purge valve can be cleared while underwater. Simply press the top of the mask to the forehead and blow out the nose. Air will bubble into the mask, pushing the water out the bottom. The next step in learning the basics of snorkelling is to practice while in open water, when you cannot touch the bottom. To do this you will need to be comfortable with using your snorkelling fins to stay afloat upright as well as to move around while floating face down in the water. As you swim along the surface, practice breathing evenly through your snorkel. The most common underwater kick is the basic flutter stroke. When used properly, this kick can be a very fast and efficient method of transportation in the water. As you kick, use a slow, comfortable pace and remember to keep your fins submerged in the water. You should find that a pace of about twenty kicks per minute will give you a good cruising speed through the water without too much fatigue. 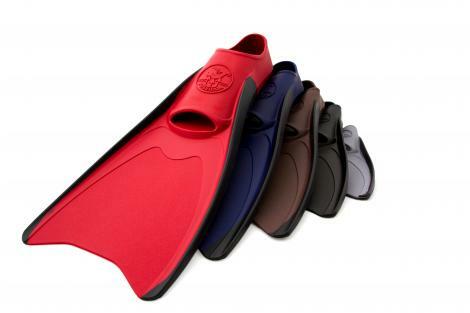 Breaking the water surface with your fins uses more energy and decreases the efficiency of your kicks. Keep your arms at your sides while swimming to reduce drag. Another common kick is the dolphin kick, in which both legs sweep up and down together. This kick can be more difficult to master but is a very efficient means of underwater propulsion when learned properly. Locations where Snorkeling are possible in India. When it comes to snorkeling equipment, the mask is the centrepiece of the collection. A proper mask serves as the window between a snorkeler and the world beneath the water. Without a mask in place to serve as a lens, divers would have significantly reduced vision and distorted perspective. For this reason, when choosing a mask, a snorkeler should pick one that provides a clear, unobstructed view and does not limit peripheral vision. Some masks include side windows, to allow for wider vision, while others simply widen the front lens. Tinted glass should be avoided. The next step in finding a proper mask is to ensure that it fits with your face, that it creates a reliable seal, and that it will not leak during a long dive. Testing a mask for leaks can start when you first pick up the mask. First, note the materials and design of the mask. Masks should have a stiff body to ensure a snug fit and a soft flexible skirt where the mask presses against your face. Next, test the fit of the mask against your face. Does it fit snugly or does it pinch or feel loose? A good test to see whether a mask is a good fit is to hold the mask up to your face with the strap hanging loose. Once you push the mask gently onto your face you should be able to keep the mask on simply by inhaling slowly. The air pressure within the mask should keep it firmly secure. If you have to breathe in forcefully to keep a mask on it is a sign of a bad fit. Next, tighten the straps somewhat and get a feel for the mask when it is fixed in place. Sometimes a mask will seal tighter with a looser strap, sometimes with a tighter strap, but avoid the temptation to over tighten a mask to try and eliminate leaks. 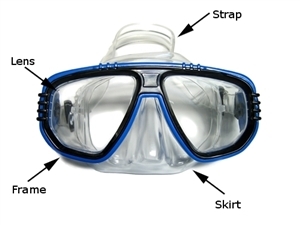 A snorkeling mask strap is used mainly to keep the mask from slipping off the face. The real seal is provided by water pressure. Also, because a diver’s mouth is a different shape when they have a snorkel in it a diver should try on their mask while wearing the snorkel in order to get a feel for the entire system. Because you will also expect to be making various small head movements, try turning your heat and looking around through the mask to make sure you have the range of motion. It is impossible to know whether or not a mask will leak until you actually go for a dive, but using a mask out in a swimming pool is a good way to see if it will leak. Sometimes even a small tub of water can give you a sense of a mask’s seal or potential for leaks. Often, an improperly fitting mask will allow a certain amount of water to trickle in. This inflow, though often very small, can eventually build up to a considerable amount of water during a longer dive and must be removed. A purge valve, a built in feature on some masks, allows a diver to do that by breathing out through the nose, but all snorkelers should learn to clear out their masks with or without a purge valve. Finally, masks exist for snorkelers of all shapes and sizes including masks specifically for women and children. Divers who wear glasses can find masks with built-in prescription lenses, or can have special lenses fit into a mask. Some divers prefer to wear contact lenses while diving, but these may get lost if a diver loses their mask while underwater. Whatever your needs, chances are there is a mask out there that is right for you. 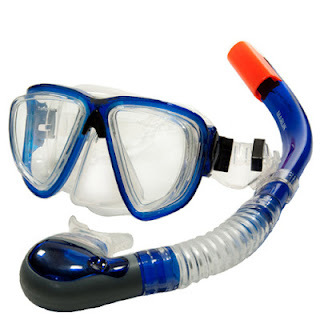 A snorkel is a flexible tube, generally made from plastic or stiff rubber, which connects a snorkeler to the surface air. Snorkels are a diver's lifeline, allowing them to breathe while their face is in the water. The right snorkel should let you breathe easily and comfortably for extended periods of time, without making you short of breath or light-headed. Snorkel designs vary based on bore diameter and length, and should be chosen based on a snorkeler’s needs and body type. Generally, the larger you are the larger the diameter of your snorkel should be, as it will allow more air to pass through. If the bore is too wide, however, it may make it more difficult to clear water from the snorkel. Similarly, although longer snorkels allow a swimmer to breath air at a deeper level, they also make it more difficult to take in air and during long dives may cause buildup of stale air in the tube. Most snorkels measure between 12 and 18 inches, but choose one that feels comfortable for you. Next note the construction of the snorkel’s mouthpiece. Because every diver has a differently shaped mouth, you should choose a snorkel that fits comfortably on you. A snorkel mouthpiece is composed of two parts, a large oval lip flange, which fits just inside the diver’s lips, and the bitepiece, which is gripped between the diver’s teeth. The bitepiece should be held securely between the teeth but does not need to be bitten down hard upon. The real seal is provided by the lips covering the flange. As with dive masks, snorkels can occasionally become filled with excess water, often from splashing waves on the surface. Drain valves are a feature offered on some snorkels designed to let a snorkeler expel the water more easily. Drain valves are one-way valves that let a diver expel water from their tube while continuing to breathe. Even without a drain valve on your snorkel, clearing excess water from the tube is a very easy process. Simply breathe out sharply to force the water out the top of the tube. Nevertheless, some manufacturers claim that snorkel drain valves can make the process easier and more efficient by providing an extra outlet for the water. Some snorkels come with special tips designed to prevent water from entering in the top. The most common design is a simple ping-pong ball held in a tiny cage. Another design utilizes diagonal plates at the end of the tube, which allow air in and out and water to flow out, but which direct incoming water out through the sides of the tube. Most divers find that such devices are unnecessary and ineffective, but some appreciate not having to worry about inhaling water from an unexpected wave. 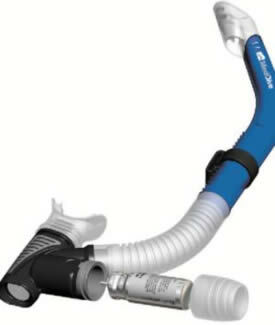 Snorkel tips may also reduce airflow into the snorkel, making it harder to draw in breath and increasing the buildup of stale air in the tube. Finally, many snorkels are being designed with additional features. Some snorkels and masks have a clip system in place to make it easier to attach and detach the snorkel from the mask. Other snorkels are designed to be collapsible or to fold in half for easier storage and transportation. These additional features are often not necessary for a simple snorkel dive, but may be useful for other reasons. 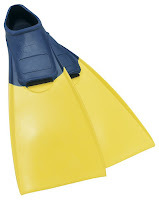 Snorkel fins are a frequently overlooked piece of snorkeling equipment which make a huge difference in snorkeling as they provide the propulsion system when in the water. Snorkeling without fins is certainly possible, but fins add so much speed and manueverability to snorkeling, it really is a different experience without them. Fins give swimmers more power to move through the water, increasing their swim speed by approximately fifty percent. Fins also focus all propulsion power in the legs, taking the strain off a swimmer’s arms and freeing them to handle equipment and explore. 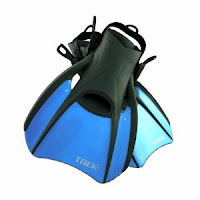 There are two basic types of fins, open-heel fins and full foot fins. To be used effectively a diver’s fins must fit comfortably and securely. Too tight and they can hurt and cause blisters, too loose and they may chafe or fall off. Full foot fins, which fit over the entire foot, offer more protection to the bottom of a diver’s heel, but because they are not adjustable they do not provide as secure a fit. Open-heel fins, which are held in place by an adjustable strap, can be more secure and often easier to put on and take off. However, because they provide no protection for the bottom of the foot, many divers choose to wear Neoprene booties when using open-heel fins, to protect their feet against sharp objects and rough underwater surfaces. Whichever type of fins you decide to use, all divers should become comfortable with their fins both in and out of the water before taking them out for a dive. Although fins are designed to make it easier to maneuver through water, they take more effort to move than bare legs, so beginners may find their legs tiring out more quickly than they expect. 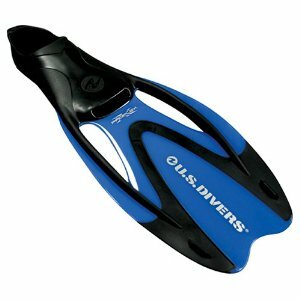 Fins with longer and more rigid blades take more effort to swim in, so beginner divers are encouraged to use smaller, more flexible fins. Initially, many divers find it cumbersome and awkward to walk around on land with their fins on. Be sure to practice and get comfortable with your fins on dry land, practice lifting your feet high to prevent the blade of the fins from tripping you. You may prefer to enter the water backwards to make it easier to walk into the surf.